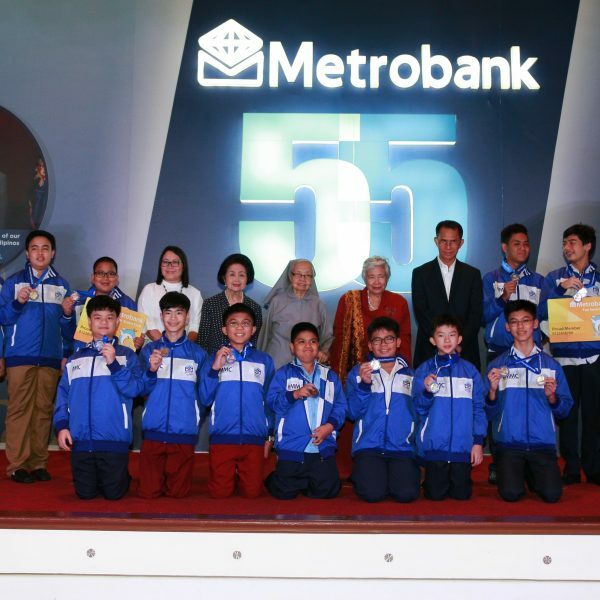 The country’s young math geniuses competed during the national finals of the 2018 Metrobank-MTAP-DepEd Math Challenge (MMC) National Finals, held last March 24, 2018 at the Metrobank Plaza Auditorium in Makati City. Out of the 574,823 students who competed in the nationwide elimination rounds, a total of 48 students representing 30 public and private schools have successfully advanced to the final leg of the competition this year. The national finals showcased the mathematical proficiency of Grade 6 and Grade 10 students who competed in both individual and team categories. The challenge consisted of solving complex mathematical problems mentally within 15 seconds and additional rounds of 30-second and one-minute questions using pen and paper. In addition, national finalists were provided with tablet computers through which they send answers directly to the judges, who then immediately mark them as “correct” or “wrong”. The MMC is the first math competition in the Philippines to use this technology that leads to faster generation of contest results. Out of the 30 competing schools, 19 produced their first ever national finalists. They are Ilocos Sur National High School (Vigan City), College of the Holy Spirit of Tarlac (Tarlac City), Maliwalo High School (Tarlac City); De La Salle University Integrated School (Biñan City); Palawan State University Laboratory Elementary School (Puerto Princesa City); Binalbagan Catholic College High School Department (Binalbagan, Negros Occidental); Mary Infant Jesus School (Iligan City); Mindanao State University – Iligan Institute of Technology Integrated Development School (Iligan City); Notre Dame of Dadiangas University (General Santos City); and Palanan Elementary School (Makati City). Winners were awarded by the guest of honor, Education Secretary Leonor Briones, who also delivered an inspirational message to inspire the young audience; Metrobank Foundation, Inc. (MBFI) executive director Nicanor Torres, Jr.; Mathematics Teachers Association of the Philippines (MTAP) president Sr. Iluminada Coronel, fmm; DepEd Bureau of Curriculum Development Director Jocelyn Andaya; and MBFI trustee Elvira Ong-Chan. Sean Neyers Gungon of Renato Lopez Elementary School (Mandaluyong City) was the first placer in the Grade 6 Individual Competition, while Jence Enrico Dela Fuente of Ateneo de Naga University Grade School (Naga City) and Jonathan Anacan of Alimodian Central Elementary School (Alimodian, Iloilo) were second and third placers, respectively. For the Grade 6 Team Competition, Christopher James Yap and Christian Jacob Yap of St. John’s Institute (Bacolod City) were the 1st placers. Hans Ethan Ting and Ambrose James Torreon of Rainbow of Angels Learning Center (Butuan City) placed 2nd while Timothy Lawrence Andal and Benjamin Jacob of St. Philomena Academy of Lipa (Lipa City) were 3rd. For the Grade 10 Individual Competition, Dion Stephan Ong of Ateneo de Manila Junior High School (Quezon City) was the 1st placer, while Andres Rico Gonzales III of Colegio de San Juan de Letran (City of Manila) settled at 2nd and James Matthew Young of Iloilo National High School-Special Science Class (Iloilo City) placed 3rd. In the Grade 10 Team Competition, Andres Rico Gonzales III and Alec Nowell Ranara of Colegio de San Juan de Letran (City of Manila) were the 1st placers. Dion Stephan Ong and Matthew Ernest Quinto of Ateneo de Manila Junior High School (Quezon City) placed 2nd while James Matthew Young and Leann Patricia Ganzon of Iloilo National High School-Special Science Class (Iloilo City) were 3rd. National winners received trophies, medals and cash prizes of PhP 10,000 each. Educational subsidies were also given through the winners’ Metrobank Fun Savers Club savings account, which encourages kids 17 years and below to save for their future. Meanwhile, all national finalists received giveaways sponsored by Casio Philippines, Manila Tytana Colleges, Philippine Science Centrum, Active Fun Children’s Play and Party Centers, Tom’s World and Money Tree. Other cooperating institutions include PSBank, Itemhound, and City Garden Hotel Makati. Now on its 17th year, MMC is the most widely participated math competition in the country among elementary and high school students. Over the years, MMC has produced national winners who get to compete and eventually win in international competitions, such as the 57th International Mathematical Olympiad (IMO) held in Hong Kong where the Philippines garnered its first gold medals. 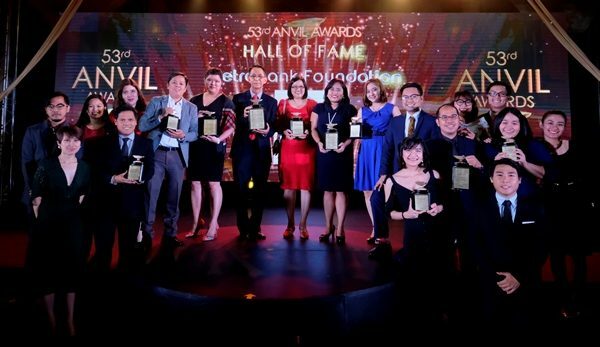 Nominations are now accepted for the 2018 Metrobank Foundation Outstanding Filipinos. 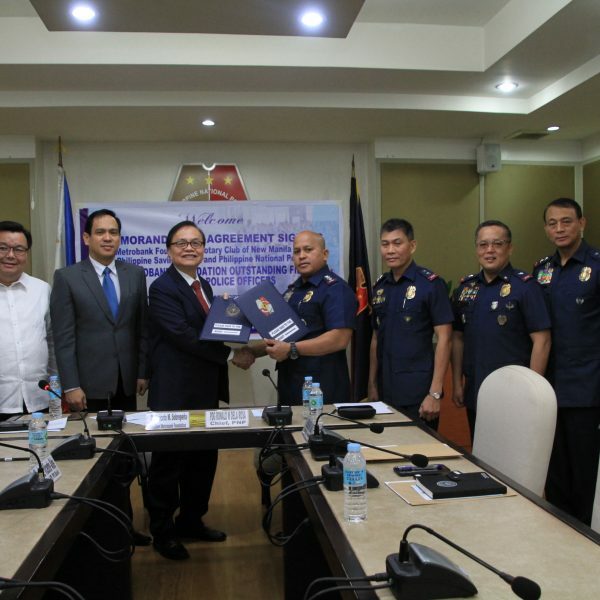 The announcement was made by Metrobank Foundation president Aniceto Sobrepeña during the MOA signing with the Armed Forces of the Philippines (AFP) on February 5 at Camp Aguinaldo in Quezon City, through the presence of AFP Chief-of-Staff General Rey Leonardo Guerrero. Ten (10) Filipino exemplars – 4 teachers, 3 soldiers, and 3 police officers – will be recognized for their initiatives and concrete contributions to the development of their sectors and communities. The awardees will be honored during Metrobank’s 56th anniversary celebration in September and each of them will receive one (1) million cash prize, a trophy, and a gold medallion. 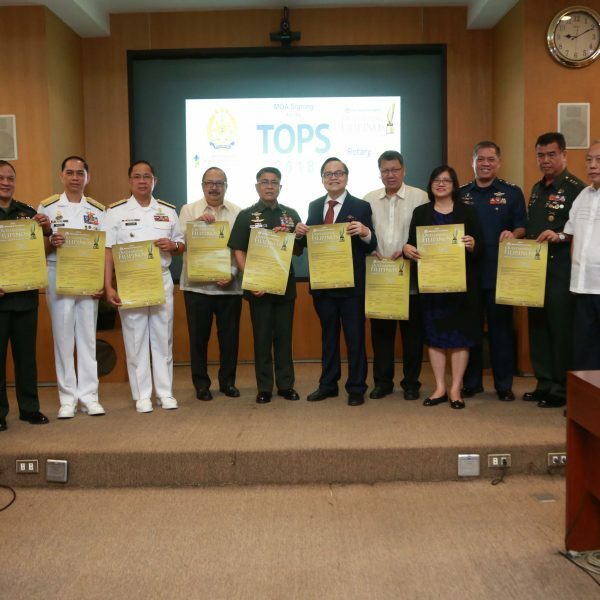 “Through the Metrobank Foundation Search for Outstanding Filipinos, we want to further highlight the overall contributions, inspiring stories of gallantry, innovations and sacrifices of modern day heroes and heighten general public’s appreciation of these professions and the institutions they represent,” said Sobrepeña. Under the search, teachers, soldiers, and police officers who are eligible to join must have a minimum of 10 years of service with at least “very satisfactory” rating in the last 10 years of service to their profession. Those who are set to retire must have at least 3 remaining years of service. Qualified elementary and secondary teachers must have completed academic requirements for Master’s Degree while Higher Education teachers must have a doctorate degree. Qualified AFP commissioned officers (Captain to Colonel) must have completed a Bachelor’s Degree while AFP enlisted personnel (Corporal to Chief Master Sergeant) must have completed a High School degree. PNP commissioned officers (Police Inspector to Police Senior Superintendent) and non-commissioned officers (Police Officer 2 to Senior Police Officer 4) must have completed a Bachelor’s Degree. Nomination forms and detailed guidelines are now available via the Metrobank Foundation Outstanding Filipinos Facebook page. Deadline for nominations to be sent to the MBFI Secretariat is on March 1, 2018. For further inquiries, you may call telephone numbers (02) 898-8898, (02) 857-8757, (02) 945-7006 or mobile numbers 0956-873-4684, 0925-830-3717, and 0933-522-4186. Please look for Kristal Todcor (teachers), Third Salang (soldiers), and Beni Benipayo (police officers). You may also send inquiries via email to oustandingfilipinos.mbfi@gmail.com. Nomination forms can also be accessed through www.http://www.mbfoundation.org.ph. Metrobank Foundation, Inc. (MBFI) president and GT Foundation, Inc. (GTFI) executive director Aniceto Sobrepeña (seated, 4th from left) and Department of Social Welfare and Development OIC Emmanuel Leyco (3rd from left) lead the ceremonial turnover of assorted food items to beneficiary families during the MOA signing for the 2018 Bags of Blessing at the DSWD Central Office in Quezon City last February 8, 2018. Joining them are MBFI executive director Nicanor Torres, Jr. and DSWD Undersecretary Florita Villar. In support of the government’s anti-poverty programs, the GT Foundation, Inc. (GTFI)—the family foundation of Metrobank Group founder and chairman Dr. George S.K. 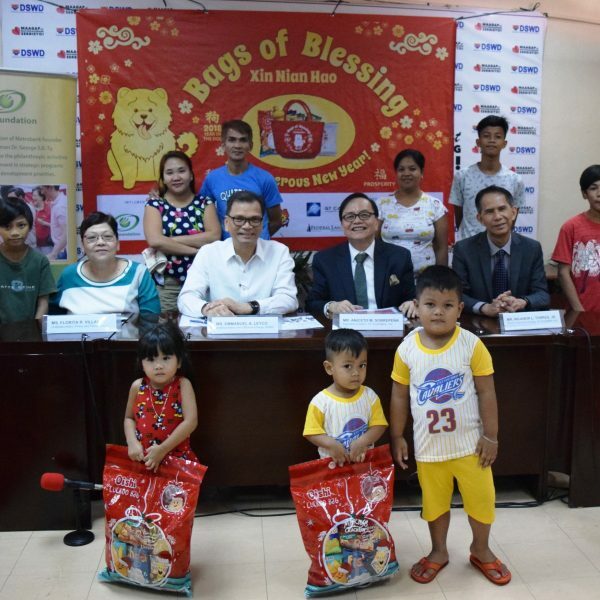 Ty—together with the Metrobank Foundation, Inc. (MBFI), renewed its partnership with the Department of Social Welfare and Development (DSWD) for the conduct of the 2018 Bags of Blessing (BOB). DSWD officer-in-charge Emmanuel Leyco and MBFI president and GTFI executive director Aniceto Sobrepeña led the MOA signing held on February 8, 2018 at the DSWD Central Office in Quezon City. Now on its sixth year, BOB is a series of nationwide gift-giving activities catering to underprivileged families in select areas nationwide in celebration of Chinese New Year. 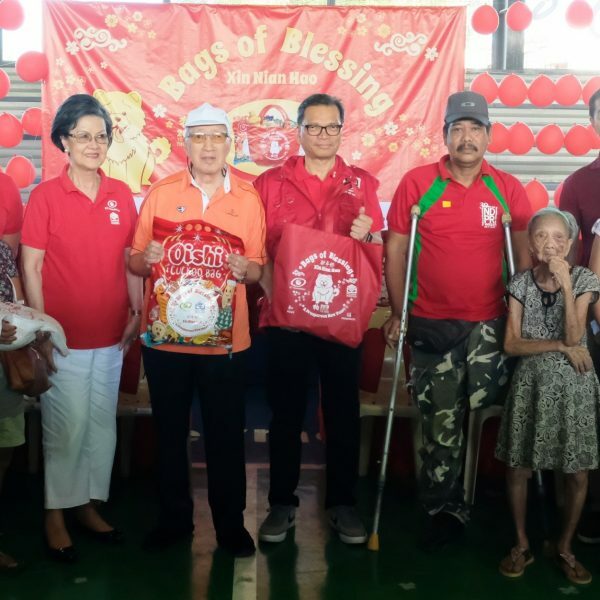 Instead of the traditional “ang-paos” (red envelopes containing monetarial gifts), bags containing PhP 1,000 worth of food items will be distributed to 10,000 underprivileged families. A total of PHP 10 million worth of these bags are slated for distribution in 21 cities and municipalities nationwide. 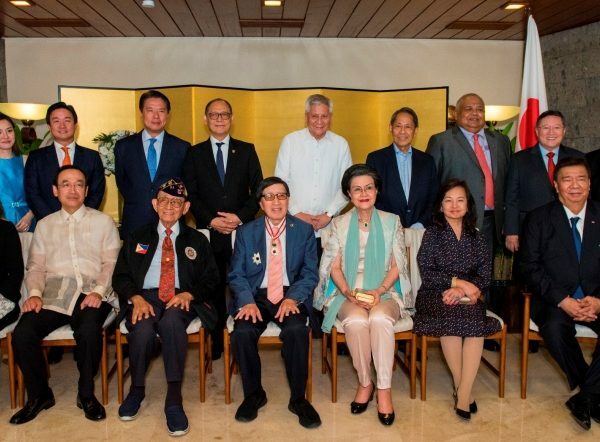 Japanese Ambassador to the Philippines Koji Haneda held a reception to celebrate the conferment of the The Order of the Rising Sun, Gold and Silver Star, upon Metrobank Group chairman and founder Dr. George S.K. Ty last February 28, 2018 at his official residence in Makati City. Distinguished officials from the government, business, civil society, media, and the diplomatic community graced the event. Dr. Ty was conferred with the award by Japanese Prime Minister Shinzo Abe on behalf of Emperor Akihito last November 7, 2017 at the Matsukaze-no-Ma, Imperial Palace in Tokyo, Japan. The Emperor later received Dr. Ty together with other 2017 honorees at the Houmei-Den. The recognition was given to Dr. Ty for his efforts in strengthening Philippine-Japanese economic relations. In particular, he undertook landmark joint ventures with several Japanese companies in key sectors such as automotives, real estate development, investment banking, insurance, and consumer finance. By facilitating the entry of Japanese investments into the Philippines, Dr. Ty has contributed to the country’s economic development. He is also the founder and chairman of Metrobank Foundation, Inc. (MBFI), the corporate social responsibility arm of the Metrobank Group, and GT Foundation, Inc. (GTFI), the Ty family foundation. Guided by his philosophy that leadership in business implied leadership in community service, MBFI implements various programs in the areas of excellence recognition, education, healthcare, arts and culture, and disaster response. In addition, Dr. Ty serves as the group chairman of GT Capital Holdings Inc., a major Philippine conglomerate composed of Metrobank, Toyota Motor Philippines, Federal Land, Pro-Friends, AXA Philippines, Toyota Financial Services, and Toyota Manila Bay Corporation. During the reception, Dr. Ty thanked the Japanese government and said that the award also belongs to everyone who has contributed to his life and work. He said, “I will forever cherish this award as I consider it a testament to landmark joint ventures I undertook with the Japanese people. It overwhelms me that Metrobank’s move to diversify in 1988 and venture into the automotive industry has contributed to strengthened Philippine-Japanese economic relations.” He noted that such partnerships with Japanese companies have been key to the sustained growth of the Metrobank Group and GT Capital Holdings. Established in 1875, the Order of the Rising Sun is awarded by the Japanese Government to those who have made distinguished achievements in areas such as international relations, culture and the arts. SGV & Co. founder Washington SyCip also received this particular award last June 2017 for his contributions to Philippine-Japanese business relations. 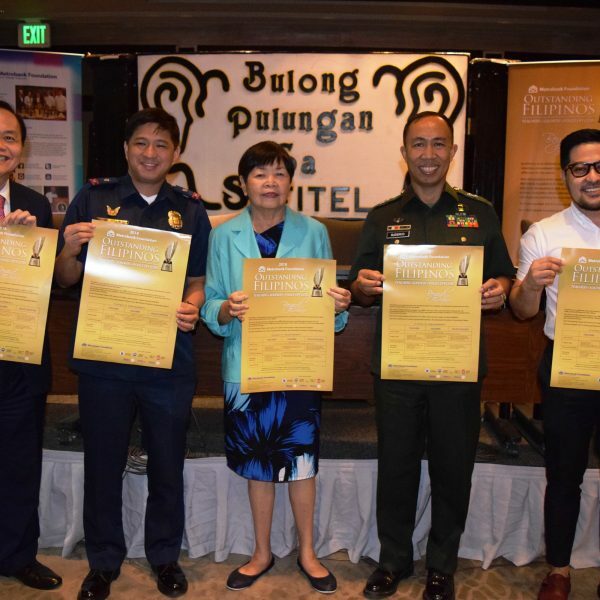 Bulong Pulungan supports call for nominations for the 2018 Metrobank Foundation Outstanding Filipinos. In attendance were 2017 MBFI Outstanding Filipinos: Police Chief Inspector Rosalino Ibay, Jr. (Manila Police District Intelligence and Operations Unit chief, 2nd from left), Lt. Col. Elmer Suderio (head executive assistant at the Office of the Commanding General, Philippine Army, 4th from left), and Dr. Alonzo Gabriel (professor and university scientist at the University of the Philippines Diliman, 5th from left). 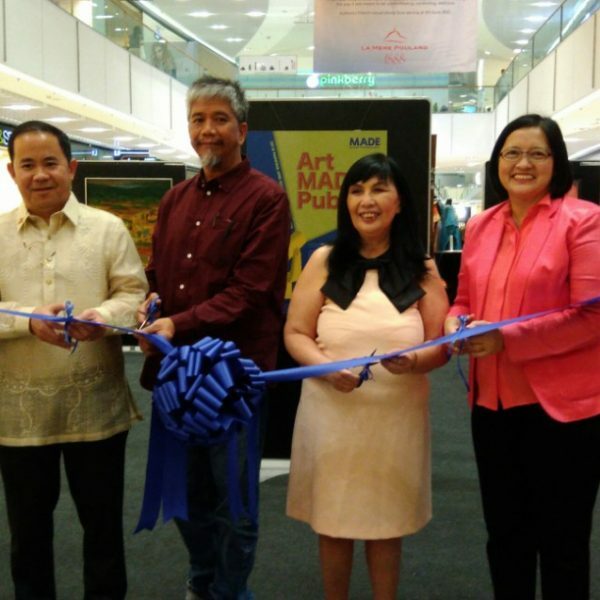 Joining them in the photo are Metrobank Foundation president Aniceto Sobrepeña (1st from left) and Bulong Pulungan founder / Manila Bulletin columnist Deedee Siytangco (3rd from left). These are challenging times to be a public servant—especially a teacher, a soldier, and a police officer—in our country. But to say that exemplary public servants are a dying breed would be a great disservice to those who have selflessly pledged their lives in the pursuit of service to our nation. These individuals—who go about their work quietly, pursuing advocacies and initiatives that yield positive change in their respective communities—deserve due recognition. This was the message delivered by the Metrobank Foundation, Inc. (MBFI) to media attendees during the Bulong Pulungan sa Sofitel press conference last January 16, 2018. Another batch of 10 Metrobank Foundation Outstanding Filipinos will be recognized—4 teachers, 3 soldiers, and 3 police officers. Each awardee will receive a PhP 1 million cash incentive, a trophy, and a gold medallion and will be awarded during Metrobank’s 56th anniversary celebration in September. 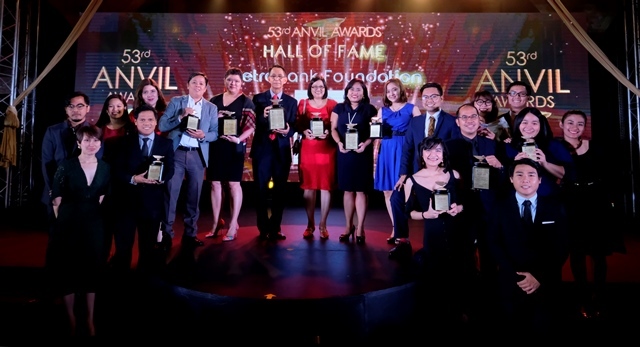 “Beyond professional accomplishments, we aim to look for everyday heroes who have gone beyond personal limitations to earn outstanding achievements,” said MBFI president Aniceto Sobrepeña. 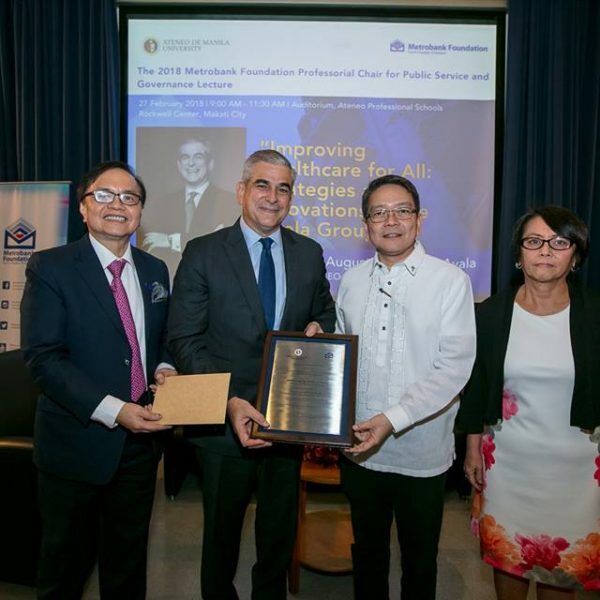 “The Metrobank Foundation is privileged to highlight their achievements in inspiring change in their respective institutions and for sharing their stories of steadfast commitment in nation-building,” he added. Present during the press forum were 2017 Metrobank Foundation Outstanding Filipinos—Dr. Alonzo Gabriel (professor and university scientist, University of the Philippines Diliman), Lt. Col. Elmer Suderio (head executive assistant at the Office of the Commanding General, Philippine Army), and Police Chief Inspector Rosalino Ibay, Jr. (District Intelligence and Operations Unit chief, Manila Police District). They talked about the challenges they faced, their advocacies, and the impact of the award in their lives. They also provided tips to potential nominees. Visit our Metrobank Foundation Outstanding Filipinos Facebook Page.